I am knowledgeable of important questions that should be asked before selecting a senior living community. However, until I have truly walked in the shoes of seniors facing the important decision of choosing the right senior living, I cannot fully surmise what matters most to Seniors considering Independent Living or Assisted Living. In an effort to dig deeper into what potential senior shoppers should consider before selecting a senior living community, I sought the help of Foulk Manor South resident Floyd Jury. 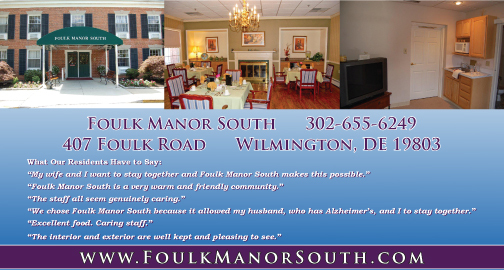 Mr. Jury, age 80, has been a resident of Foulk Manor South for 2 years. He vividly remembers making the transition into Assisted Living with his wife; his input will prove to be invaluable in presenting seniors with important questions and factors to consider when choosing a senior living community. He has agreed to be honest and forthright in his answers. “Many people give more thought to planning their young child’s birthday party than they do selecting a Senior Living Facility for themselves or their elderly parents. That’s a mistake, since it is likely one of the last important decisions to be made for yourself or for your parents,” said Jury. Meals are an important part of your life. Therefore, you should ask to retain a copy of the lunch and dinner menus for the past week. In addition, you should sample both the lunch and dinner meals the day of your visit to the Senior Living Facility. The Host will likely want to isolate you to a separate table, but you should insist on sitting with at least four different residents at each meal. That way you will get a sample of what life is really like in the Senior Living Community. Activities are also important to keep your mind and body active. Ask for a copy of the current month’s activity list, and have the Host thoroughly explain each activity. If there is an activity going the day of your visit, spend some time with it to gain an understanding. Ask what extra amenities are available such as beauty shop/barber, laundry, library, TV lounge, etc. Always inquire about additional fees. Is there an on-site place where you can buy toothpaste, hairspray, or other minor supplies? Ask to see the actual apartment you would be moving into. Request a scale copy of the floor plan. If they don’t have one, make one for yourself so you can begin planning the layout of your belongings. Consider how convenient the location of that apartment would be to the elevator, nurse’s station, dining room, and all the other facilities you would frequently use. If you are a couple, ask what happens if one person’s health declines to the point where more intensive care is needed on a permanent basis. Will that care be available in the same building? What happens to the other person; will they have to move? This was a very personal issue for me before my wife died. I chose Foulk Manor South primarily for this reason. Is there a Physician, Podiatrist, and Nurse available to the facility to monitor the health needs of the residents? How does this operate, and how is it paid for? What about mail? How do I receive incoming mail, and how do I mail outgoing letters and packages? Can I have my own personal TV, telephone, and internet service in my apartment? Take advantage of trial respite stays. Assuming you have made a tentative choice on this Senior Living Facility, ask the Host if it would it be possible to move in, on a trial basis, for a month or two just to make certain that you like what you have chosen? How much is this chosen Senior Living Facility going to cost each month, and how stable will that cost be? In concluding my interview with Floyd Jury, he was insistent that the readers remember that the selection of a senior living is one of the most important decisions that a senior will ever make in their lifetime. Hopefully, these sample questions will help stimulate some additional questions that are reflective of your personal situation and will help you make an intelligent decision on your selection of a Senior Living Community.